As a marketer, my ability to anticipate digital marketing trends, and effectively utilize those trends, are skills I must continually grade myself on. Not to satisfy my ego, but to provide clients with the most effective means of interacting and communicating with their target audience(s). Just as your business evolves, so do the ways in which your audience interacts with you, and your competitors. More importantly, each target audience is unique. Unique in their expectations, their purchasing behaviors, and the ways in which they connect with you. That being said, not all digital marketing trends will align with your marketing needs, but it is important to be aware of their existence. From social media ads to high-quality tutorial videos, it is increasingly essential to satisfy the population’s ever-decreasing, goldfish-mimicking attention spans. Video is the most interactive and engaging type of content available today. 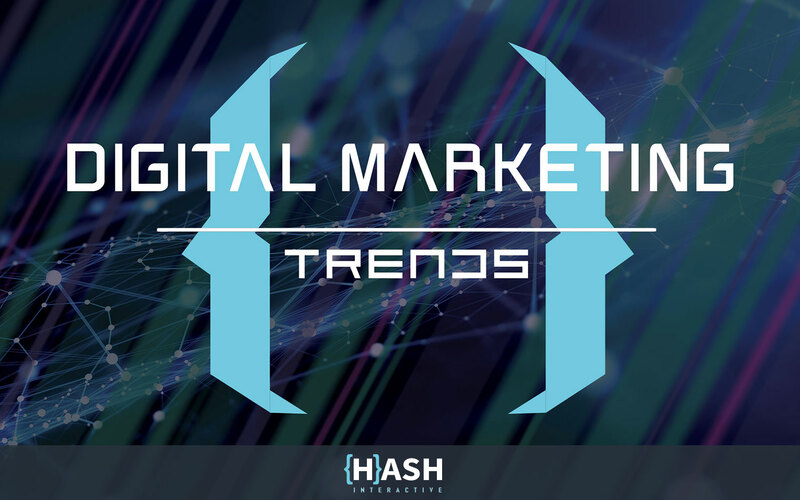 It is also the most dominant, and of these digital marketing trends, possibly the most important. According to the marketing experts at Brafton, online video will account for 74% of all online marketing content by the end of 2017. If you don’t have, or have failed to even begin planning, a video marketing strategy, you are missing out on a massive opportunity. An opportunity to dramatically increase brand awareness, online engagement, and lead generation. Google has even started ranking companies higher based on the amount of quality video content published on their website and social media channels. But before you start uploading videos like it’s going out of style, it’s crucial to understand the importance of producing quality over quantity. While Google possesses the intelligence to decipher the difference between low and high quality, it’s the overwhelming amount of content your customers are being fed each day that should dictate your focus on quality. As the endless scrolls of content continue to consumer our digital lives, becoming terminally desensitized is becoming a road most traveled. It has become essential to create engaging narratives for your audience to follow and experience. Each touchpoint, whether it’s social media, your website, or a Youtube video, should stay true to your unique offering, while simultaneously adding value and relevance. Many brands today fail because of their unbreakable gaze on selling, and not on providing genuine and unique value to their followers. GoPro is an amazing example of breaking the traditional route and embracing experience-based branding and marketing. By leveraging the viral power of video filmed on its cameras, nearly all of GoPro’s content is user-generated. They allowed followers to build their brand, as well as their ever growing ecosystem of content. By living vicariously through adventurous GoPro users, observers yearn to be adventurous GoPro users themselves. Users have become GoPro’s greatest branding, marketing, and sales team. Regardless of the business you are in, data should be your lifeblood. Not only has technology reached the point of being able to organize and manage vast amounts of data (amounts not human has the capability of processing), it now has the ability to interpret this data. Intuitive data tells us who’s buying what, when, and why. It also helps paint a picture of what type of messaging is most effective for acquiring new customers and strengthening the loyalty of current customers. As these tools continue to evolve and more companies take advantage, not utilizing the same tools will leave you at a significant disadvantage. With the rise of video, our culture has become increasingly visual. So much so, that many are demanding more from their visual experiences. High-quality video content is extremely effective, and will continue to be, but is simply viewing something enough? Augmented reality (AR) and virtual reality (VR) are nothing new. However, past efforts were primarily focused on the digitization of random, and often irrelevant, activities. Now that successful applications, such as 360° video and Pokemon Go, have narrowed in on entwining users seamlessly into their everyday activities and environments, these technologies are becoming human and empathetic. They are going beyond what other technologies offer, while simultaneously providing meaningful content. From a marketing and design standpoint, it is crucial to gain an understanding of which areas of your target audience’s lives can be visually enhanced. Although native advertising is nothing new, it continues to increase in popularity and continues to push conventional advertising into the realm of irrelevance. When is the last time you clicked on, let alone directed any attention towards, a banner ad showcased on a site you were navigating? By fusing form with function, native ads – such as Adwords, Facebook, and Instagram – match the visual design of the experience they live within and flow seamlessly with the native user experience. This form of advertising looks and behaves like natural content, whereas conventional advertising behaves as disruptive and spammy. As I mentioned above, cutting through the noise is becoming as difficult as choosing a new show to watch on Netflix. Because this form of advertising ‘blends’ in with the user’s feed, creative and unique content is essential to generating engagement. Marry this uniqueness with unmatched value and proper targeting, and you have yourself quite the experience. It’s important to note that advertising should never be used as a standalone strategy. Advertising can’t build a brand on its own and should be viewed as a single part of a larger machine. As you reevaluate your current marketing strategies and budget, it is crucial to allow these digital marketing trends to influence your decisions moving forward. Adapting to the ever changing landscape of digital and online marketing may seem daunting, but it is truly necessary. If you would like to discuss your current, and future, digital marketing practices and branding efforts, we would love to sit down and Hash It Out. Set up a meeting with the Hash team today.